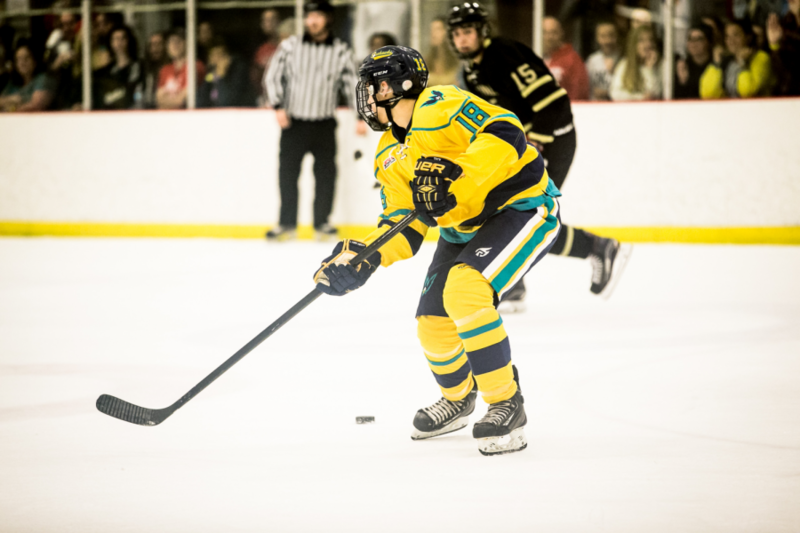 UNC Wilmington club hockey will close their 2018-19 season with a Carolina East division matchup against Duke Friday night in Hillsborough. The game is set to begin at 10:15 p.m. at the Orange County Sportsplex. The Blue Devils come into this game with a 2-10 record on the season and have scored one or fewer goals in seven of those games. The ‘Icehawks’ struggled as well, with a 3-11-3 record on the year; this is a game that both teams view as a momentum builder for next season. However, the Seahawks still need to respect their opponent which is something that defenseman Will Tooke says has been a struggle for this team. Duke is coming off a two-game stretch to start their spring semester in which the team has been outscored 24-2. The Blue Devils lost to North Carolina by a final of 10-1 on Jan. 30 and then lost to North Carolina State 14-1 Feb. 1. One of the major bright spots to the club hockey team this season has been the performance of defenseman Kent Mclaughlin. Both assistant coaches Tony McCabe and Peter Gilinson have spoken highly about Mclaughlin and the importance he has to this team going forward. Despite all the roster turnover the Seahawks have had to go through due to injury, Mclaughlin has been one of the mainstays on the blue line all year. Heading into the Duke game, Mclaughlin is hoping that the team can play to a level to where they feel like they could have been all year. “Time and time again (this year), we knew we were the better team and we underperformed for one reason or another. At this point, we are just playing for pride.” Mclaughlin added that it will be good for the team to end this season on a good note and look forward to next season knowing the talent the team will be bringing back. For captain Hunter Phillips and Tooke, this season will be remembered for the sacrifice they made to switch positions from forward to defenseman, in order to help the UNCW blue line. Mclaughlin has also helped with the transition for Phillips and Tooke and has mentioned to both that when switching to defense, it is all about communication and knowing when to take risks and when to play it safe. Mclaughlin also had high praise when it came to talking about the kinds of players Phillips and Tooke are. Following the game against UNC Charlotte last Saturday, Gilinson mentioned that he wanted the team to treat the Duke game like it was the first game of next season. That is exactly the kind of mindset that the team wants to have according to Tooke.